The evolution of physical, environmental changes around us revealed a lesser entertaining side to the #10YearChallenge widely popular on social media. The #10YearChallenge swayed the internet to upload a before and after picture of themselves tracing the changes, one has made through the years. The evolution of physical, environmental changes around us revealed a lesser entertaining side to the challenge widely popular on social media. War, climate change, deforestaion and the rise of pollution in oceans surfaced on social media revealing harsh truths that our enviournment has faced through these 10 years. 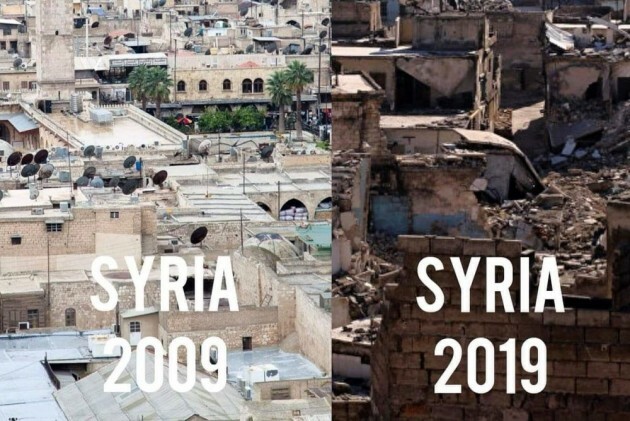 The civil war in Syria shows the deterioration of a beautiful city that once existed. Kashmir showed no change in its political atmosphere. Green pockets around the world turned to barren brown patches due to deforestation at a rapid speed. Oceans stuffed with plastic and waste material endangering marine life and causing corals to die. Climate change caused icebergs to melt drastically that reflected in the satellite pictures captured of Earth. As a result, even Polar bears have been classified as an endangered species. Survivors of gruesome violence like acid attack were also shared during this challenge.